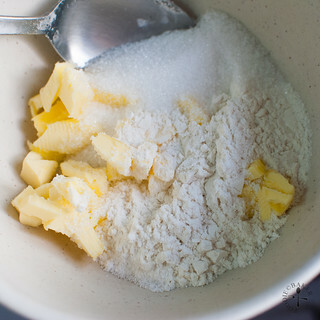 Nevertheless, I am also really looking forward towards the later half of the year as all my holiday plans are then and there are so many fun holidays coming up, like Mid-Autumn Festival, Christmas… not to mention I’m going to be hosting the Aspiring Bakers in August (Theme: Choux) and in December (Theme: Alcohol)! I am going to start planning what to cook/bake for these themes, and I hope you guys would join me in the fun too! But first let me come back to today’s bake, a Home Baker’s bake, chosen by Maria from Box of Stolen Socks this time round. 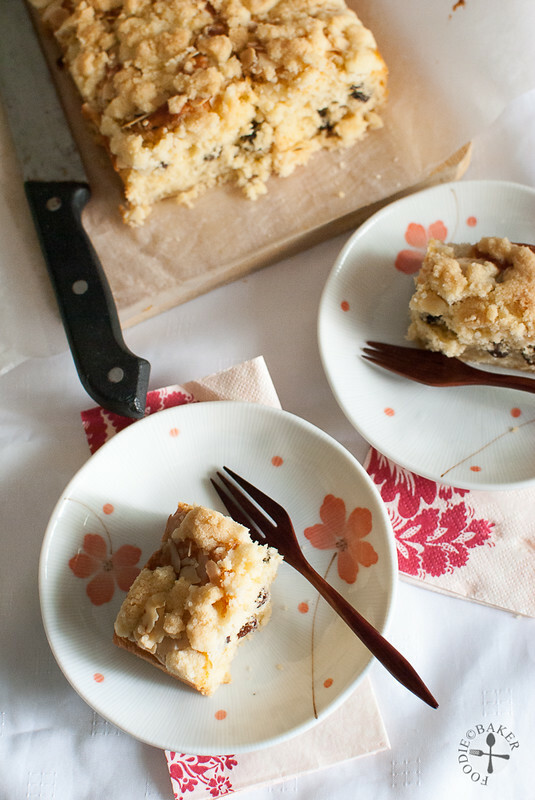 She takes really nice photos of her bakes, so do check them out! The original bake is supposed to be a cranberry-pecan studded cake, but from the title, I guess you all can tell what happened to the cranberries and the pecans. The substitution is mainly because pecans and cranberries are pretty expensive here, and almonds and raisins are cheaper alternatives. 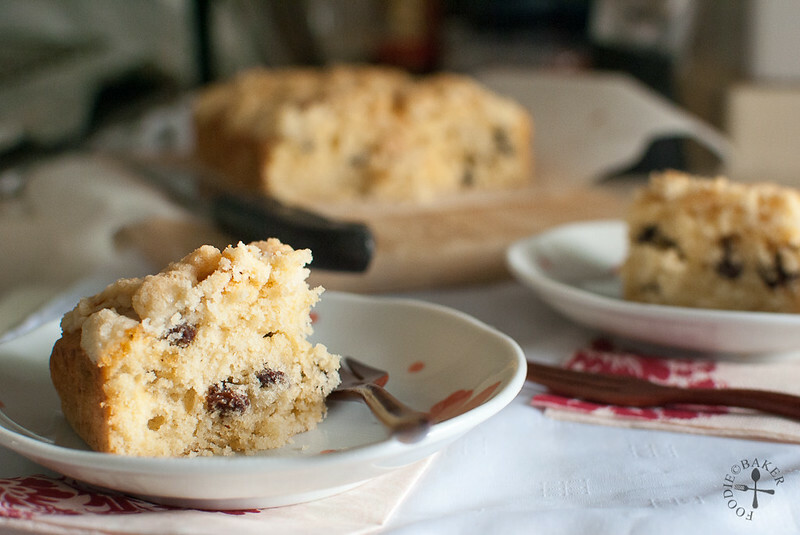 To prevent the raisins from absorbing the moisture in the cake, I soaked them in hot water until they became plump and juicy. 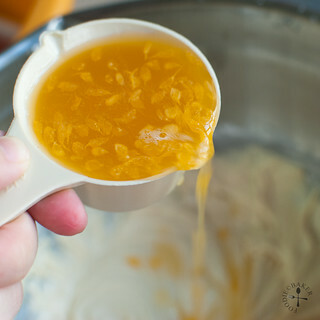 The orange concentrate was also replaced with orange juice, purely because I couldn’t be bothered to get a bottle of concentrate just for this bake – I just want to save some money… haha! 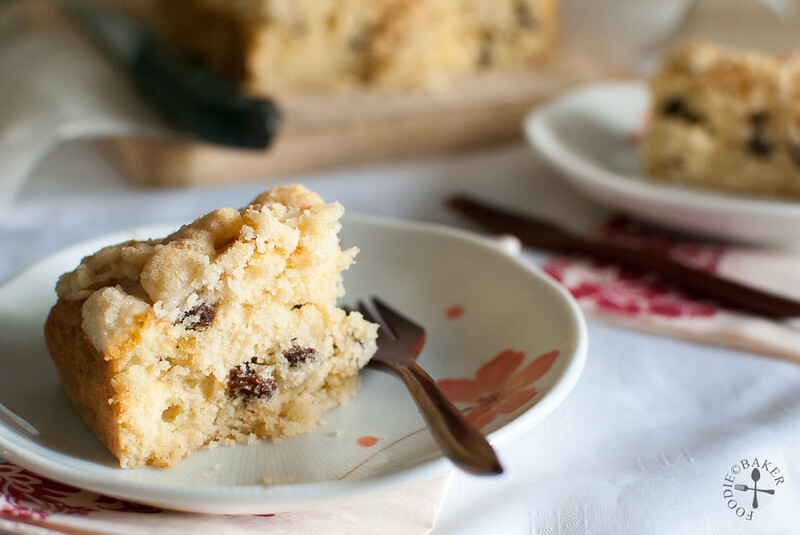 It’s a very simple and light butter cake, with the streusel topping (very similar to the topping on my polo buns) making a crunchy crust, perfect with a cup of coffee or tea! And here’s how to bake the cake! 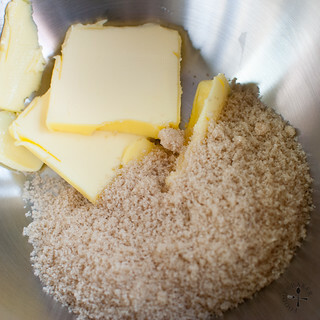 1) Measure brown sugar and butter together. 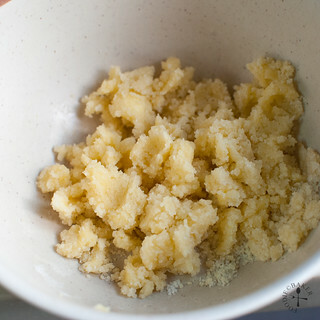 2) Cream till light and fluffy and beat in the egg. 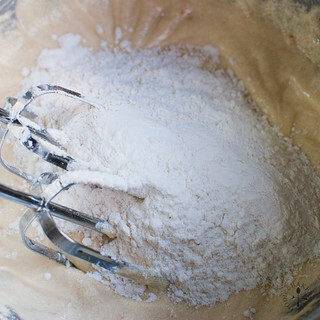 3) Sift and stir in 1/2 of the flour mixture. 4) Stir in some orange juice. 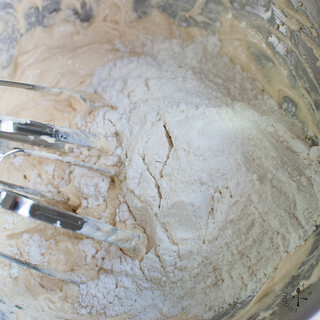 5) Sift and stir in remaining flour mixture. 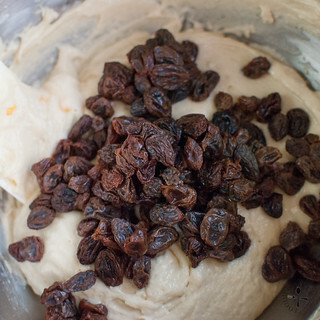 6) Stir in some soaked and drained raisins. 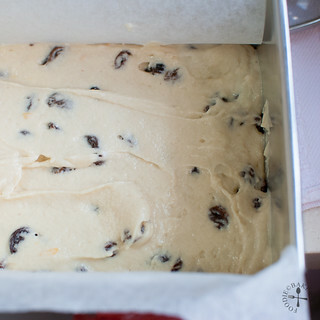 7) Transfer the batter to a lined tin. 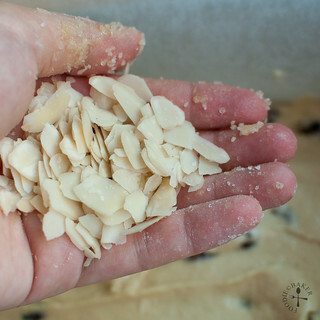 8) Sprinkle almond flakes all over. 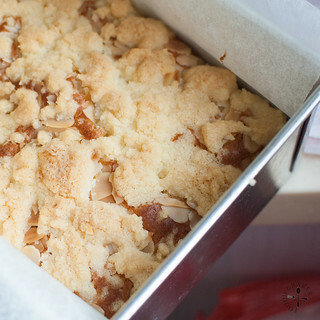 11) Sprinkle the streusel all over the almond flakes. 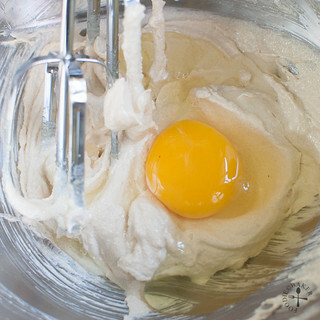 12) Then bake until the cake is done! Let cool, slice and serve! I’m submitting this cake to The Home Bakers – do check out here for other Home Bakers’ attempt! Notes: I made only 1/2 of the recipe and baked it in a tin instead of a pie pan as I was worried about seepage of the batter. 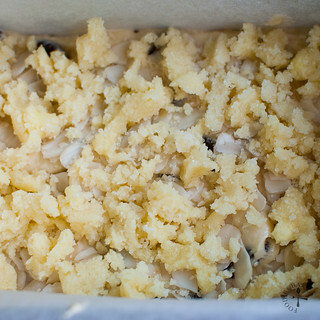 You can substitute the almonds and raisins with other nuts and fruits that you like. For the instructions, please visit Maria’s blog! I soaked the raisins in hot water and drained them when the water has dropped to room temperature. 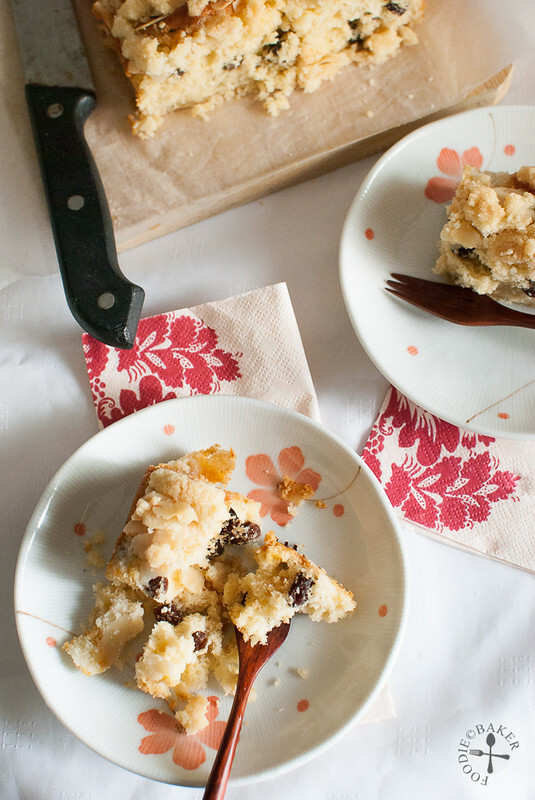 You can also choose to soak it in rum overnight to make a more “adult” cake. I baked the cake for about 15 – 20 minutes at 175 degrees Celsius.